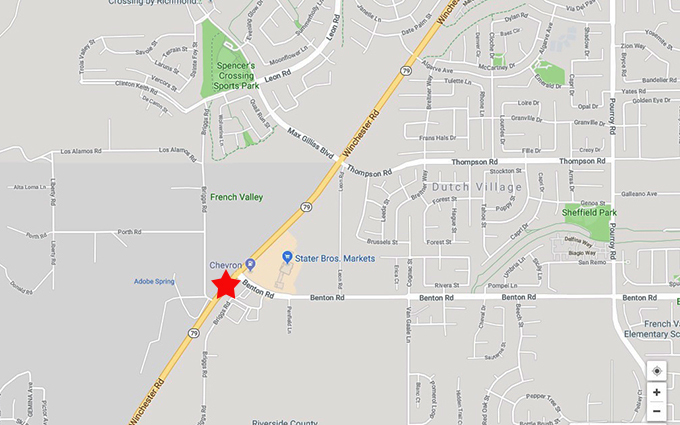 A Winchester man faces charges of murder and DUI after his vehicle crashed into another car on Sunday, killing a woman in an intersection in the French Valley community near Murrieta, authorities said. The accident was reported at approximately 5:36 p.m., according to the California Highway Patrol. Elvis E. Tate, 59, was driving northbound on Winchester Road at a stated speed of 45-50 mph in a 2003 Mitsubishi Gallant. He allegedly failed to stop for a red light at Benton Road and collided with a 2016 Honda Civic that was making a left turn from westbound Benton Road to southbound Winchester Road. The driver of the Honda Civic, a 27-year-old female from Winchester who has not been named, died instantly. A passenger in that vehicle, 28-year-old Anthony L. Lewis III, received moderate injuries, as did Tate. The vehicles continued out of control and struck two additional vehicles waiting at the red light. The driver of those vehicles were treated and released. Riverside County firefighters responded and put out as fire in one of the vehicles. After receiving medical treatment, Ellis was booked at the Southwet Justice Center in Murrieta. He is being held in lieu of $1 million bail.